Last night we had our usual Monday Meetup, and it did not fail to be a wonderful evening. 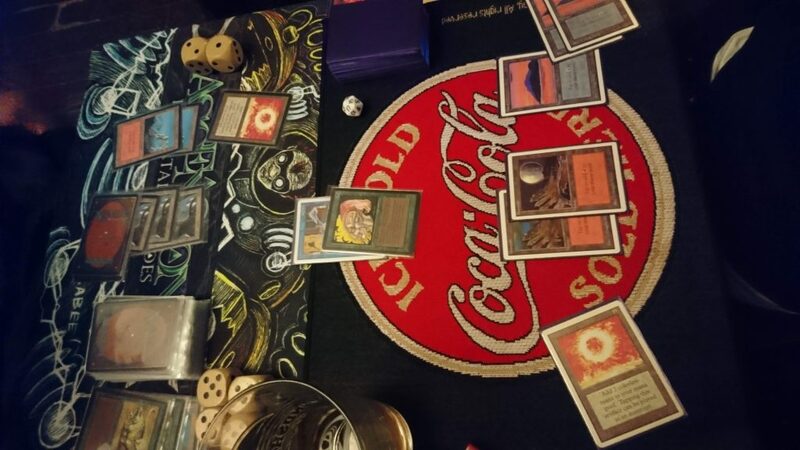 When I first arrived, there were already 4 people playing, a fifth watching, myself, and before we knew it there were around 14 of us chatting, slinging spells, checking out binders, and having fun. I was a touch worried as one of our usual tables, a four top, was occupied by people playing Cards Against Humanity, which although fun, isn’t Magic. Lucky for us, they had to leave about 30 minutes after we arrived, so we got settled in to play. I’ve been pondering what I’d like to play at The Winter Blast in March, so I decided to brew up something that’s full of cards I like. Generally speaking, cards I like tend to be lands, and in particular, I’ve always loved Urza’s lands and Desert, so I decided to go mono-brown and see how it goes. Getting 4 Deserts on board in a single game! On the left is a 60 card Alpha deck, in penny sleeves, that was beating up on the UR deck w/ that Elf and causing so much frustration that the UR player took Control of it! The Alpha player proceeded to top deck another Elf, just to add insult to injury. I can’t wait until January (my remaining 6 or so cards are waiting for me in Ohio, where I’m visiting over the holidays) to play some Alpha 40 against this deck. We also briefly discussed what to do about our next meetup, which would be on 17 Dec and initially said to cancel it and restart in the new year, but upon looking at schedules and such, we realized that it’s fine, so it’s business as usual for the next meetup. Congrats on the Toronto community. 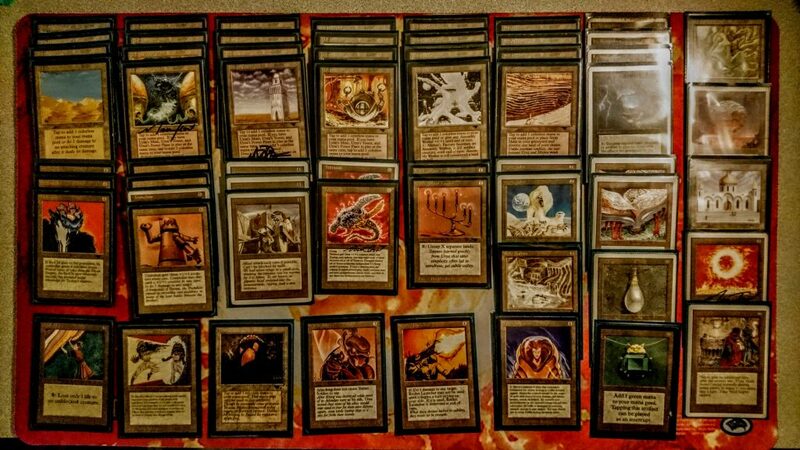 I am building my first old school deck (using Swedish style) in Montreal and although it is taking time, I enjoy the process of searching for the pieces I need. I hope to be able to come play one day in the spring or summer and meet members of the community. We play every other Monday here in Toronto, and have a tournament lined up for March 2, that is based around fun and raising money for charity. http://thewinterblast.ca if you want to check it out and register. We’d love to have more people out for games and to grow the local scene. I try to make most of my lists Swedish or easily adaptable to Swedish, and I want to start playing around with the new Atlantic Ruleset, that is basically Swedish + Fallen Empires. Are you familiar w/ the Montreal Tundra Wolves? They play regularly in Montreal, so are probably a good resource to tap if you haven’t already.